For the first time, this influential study by Ludwig Alsdorf is made available to an English speaking audience, translated by Bal Patil. 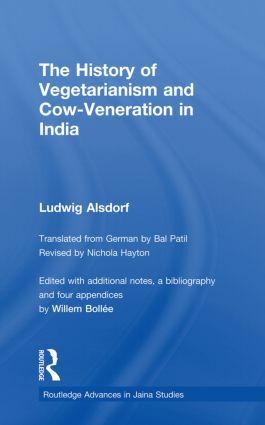 It focuses on two of the most pertinent issues in Indian religion, the history of vegetarianism and cow-veneration, and its historical approach remains relevant to this day. With reference to significant brahminical texts, such as key chapters of the Book of Manu, the book centres on the author’s analysis of the role of Jinism in the history of vegetarianism. The author explores the history of meat-eating in India and its relationship to religious thought and custom, and searches for solutions to the problem of cattle veneration. Besides a comprehensive translation of the original German manuscript "Beiträge zur Geschichte von Vegetarismus und Rinderverehrung in Indien", four important articles directly related to Alsdorf’s work by Kapadia, Heesterman and Schmidt are made available in this new edition. These additional contributions and careful notes by the editor Willem Bollée add a modern perspective to a study that remains a key reference for students and scholars of Religious Studies, Asian Studies and History. Ludwig Alsdorf (1904 – 1978) was one of the most influential Indologists of his generation. He had wide range of interests and worked on Prakrit, Apabrahmsa and Pali literature, in particular on Jaina universal history and prosody. His pioneering metrical analyses of ancient Indian literature prepared the ground for great advances in the dating of texts and the reconstruction of the history of Indian philosophy. One of his most influential studies is the present work. Willem Bollée is Professor Emeritus at the University of Heidelberg, Germany. Bal Patil is an independent researcher, journalist and Chairman of the Jain Minority Status Committee, Dakshin Bharat Jain Sabha, a century old Jain organization in India. He is the co-Author of Jainism (1974, with Colette Caillat and A.N. Upadhye), and his English translation of Ludwig Alsdorf’s Les Etudes Jaina, Etat Present et Taches Futures, edited by Willem Bollée was published in 2006. His translation of Hiralal Jain’s Jainism Through the Ages from Hindi into English is due for publication.